The spider chart is used to compare two or more items under various functions of typical metrics. Check this page to better understand the proper occasion of using a spider chart. 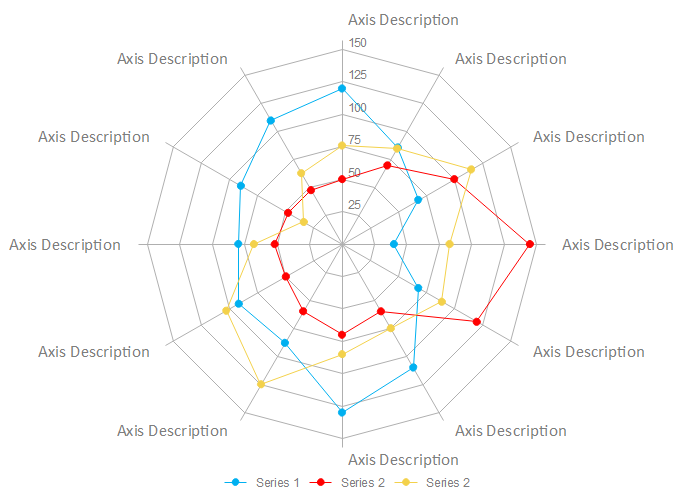 The spider chart, also called radar chart, web chart, polar chart, and star plots, is named by its special appearance. It is a chart that uses two dimensional graph to display multi-dimensional data structure. However, it has an extreme limit which more than 2 but no more than 6 items can be judged, otherwise you cannot see the data clearly. Thus, we should explore when the proper occasions of using this chart are. Generally the metrics are features or factors to be compared. They are quite disparate from each other. Often the scores assigned to each metric are relatively scaled – for instance, from 0 to 100 where higher scores indicate better performance under the metrics. Try an easy and effective Chart and Graph tool. Download it for free. When to Use a Spider Chart? Occasion 1 - Several items should be compared with more than 5 metrics of features or characteristics. The distinctive feature the spider chart owns but other charts do not have is the general comparison of all metrics to make a decision. You can judge the cover area and sharp points on the metric lines to have an overall understanding the pros and cons of those items you intend to make. 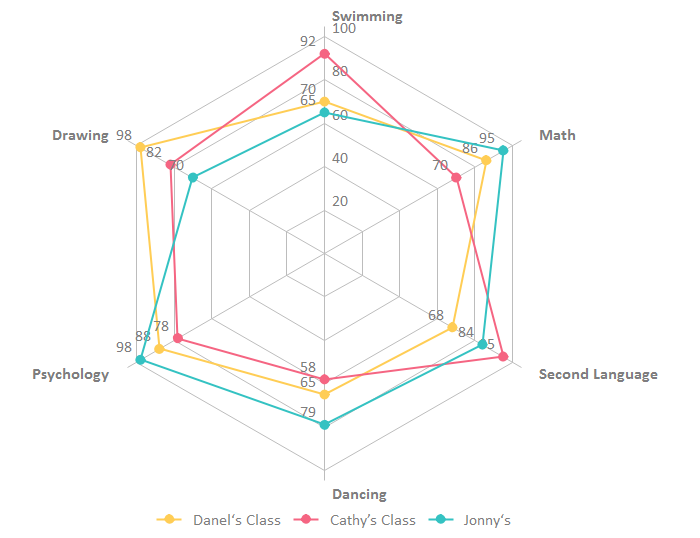 Take an education issue as an example, if you want to compare the average score of different courses in different classes, you can see the results clearly in the following spider chart. Occasion 2 - The overall situation of different items. In the spider chart, each might cover a fixed area based on its data. 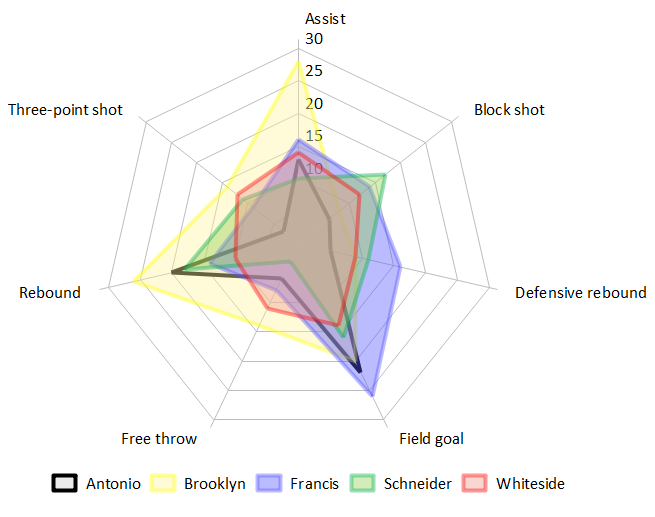 If you intend to see the coverage of each item under different metrics, a spider chart is your best choice. For instance, if a coach want to see his players’ performances in a match, he can see the overall situations of each player and analyze to provide a well-focused training plan. We can observe from below situations, several items should be analyzed by different metrics, a spider chart performs perfect in visualizing those data. Would like to draw spider chart like those examples? Please do not hesitate to have a try of Edraw, you can draw all types of spider charts handily. Edraw Chart Maker - Create and Modify Charts Easily! Edraw offers an interactive method to create and modify charts. You'll be surprised by its abundant templates, amazed by how easy it works, and satisfied with its advanced functions. Try it now!